Many names have been given to me. I have been called the "Virgin of the Passion". "the Golden Madonna", "the Mother of the Redemptorist Missionaries", "the Mother of Catholic homes". The name of my own choosing is "Mother of Perpetual Help". It is also the name by which Pope Pius IX requested the Redemptorist Missionaries to make me known. "This good brother used to tell me with a certain air of mystery and anxiety, especially during the years 1850 and 1851, these precise words.- 'Make sure you know, my son, that the image of the Virgin of St. Matthew is upstairs in the chapel: don't ever forget it... do you understand? It is a miraculous picture. 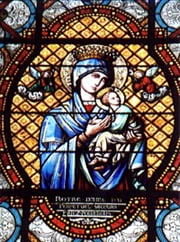 'At that time the brother was almost totally blind "What I can say about the venerable picture of the 'Virgin of St. Matthew' also called ' Perpetual Help, ' is that from my childhood until I entered the Congregation (of the Redemptorists) I had always seen it above the altar of the house chapel of the Augustinian Fathers of the Irish Province at St. Mary in Posterula... there was no devotion to it, no decorations, not even a lamp to acknowledge its presence... it remained covered with dust and practically abandoned. Many were the times, when I served Mass there, that I would stare at it with great attention." 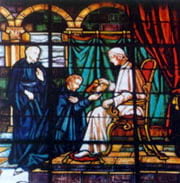 Brother Augustine died in 1853 at the venerable age of 86, without seeing fulfilled his desire that the Virgin of Perpetual Help be once again exposed for public veneration. His prayers and boundless confidence in the Virgin Mary seemed to have gone unanswered. The Redemptorists were extremely interested in the history of their new property. But more so, when on February, 7th, 1863, they were puzzled by the questioning from a sermon given by the famous Jesuit preacher, Father Francesco Blosi, about an icon of Mary that "had been in the Church of St. Matthew on Via Merulana and was known as The Virgin of St. Matthew, or more correctly as The Virgin of Perpetual Help." This beloved picture may look strange to modern Western eyes. It doesn't portray Mary as a delicate maiden with downcast eyes. Her direct gaze and strong features command our attention. We are struck by the unrealistic qualities of the figures. Jesus is the size of a toddler, but his features are those of an older child. Mary and Jesus aren't set in a scene but float against a background of gold. This picture was painted in the Byzantine style of the Eastern Church. The purpose of this style of art is not to show a beautiful scene or person but to convey a beautiful spiritual message. Because the artist is trying to communicate something more glorious than anything in this world, the picture isn't a realistic portrayal. A Byzantine painting is like a door. Seeing a beautiful door is nice, but who wants to just stand there looking at the door? We want to open the door and go beyond it. The door might be attractive or unattractive, but it is only a door, there to lead us into a new world. That's how we must approach this picture. The artist, realizing that no one on earth would ever know what Mary or Jesus really looked like, and that their holiness could never be depicted in purely human terms, has portrayed their beauty and their message in symbols. First of all you see Mary, because she dominates the picture and because she looks straight at you -- not at Jesus, not at heaven, not at the angels above her head. She looks at you as if to tell you something very important. Her eyes seem serious, even sad, but they command attention. 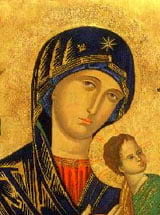 The letters above her head proclaim her the Mother of God (in Greek). Looking at the painting, we know that she has the power to intercede for us in heaven. Mary's gaze is fixed on you, but her arms hold Jesus. In Byzantine icons, Mary is never shown without Jesus because Jesus is central to the faith. Jesus too is wearing the clothes of royalty. Only an Emperor could wear the green tunic, red sash, and gold brocade portrayed in the picture. The Greek initials to the right of the child and his halo decorated with a cross proclaim that he is "Jesus Christ." Jesus isn't looking at us, or at Mary, or at the angels. Though he clings to his mother, he's looking away, at something we can't see -- something that made him run so fast to his mother that one of his sandals has almost fallen off, something that makes him cling to her for protection and love. The figures that hover on either side of Jesus and Mary -- the Greek letters above them identify them as Archangels Gabriel and Michael -- provide us with the answer. Rather than carrying harps or trumpets of praise, they bear the instruments of Christ's Passion. Jesus has seen part of his destiny -- the suffering and death he will undergo. Though he is God, he is human as well and afraid of this terrifying future. He has run to his mother, who holds him close in this moment of panic, the same way she will be close by his side through his life and death. While she can't spare him his suffering, she can love and comfort him. Mary knows there are many things in our lives that are dangerous and terrifying, and that we need someone to turn to in times of suffering and dread. She offers us the same comfort and love she gave to Jesus. She tells us to run to her as fast as Jesus did, so fast that we don't even think about what we wear or how we go, just so we get there. 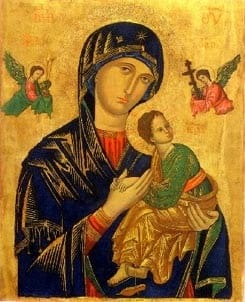 All: Mother of Perpetual Help today we face so many difficulties. Your picture tells us so much about you. It reminds us to reach out and help those in need. Help us understand that our lives belong to others as much as they belong to us. Mary, model of Christian love, we know we cannot heal every ill or solve every problem, but with God's grace, we intend to do what we can. May we be true witnesses to the world that love for one another really matters. May our daily actions proclaim how fully our lives are modeled after yours, Mother of Perpetual Help. Leader: Let us pray to be open to God's Word. All: Mary, woman of faith, you pondered and treasured the meaning of God's words and actions in your life. You generously responded to his Word in faith. As we listen to God's Word, help us be attentive to his message. May the Holy Spirit enlighten our understanding and give us the courage to put these words into practice. All: Mary, humble handmaid of the Lord, we need your example today to discover God's will in our lives. You always gave God the first place in your life. Just as you pondered his Word in your heart, help each of us to seek his plan in all that we do. Give us the conviction that nothing is more important than doing the will of our heavenly Father. May we spend each moment in loving and pleasing him. Help us follow your example in proclaiming, I am the servant of the Lord, I will what God wills, when he wills it, as he wills it, because he wills it. Leader: Mother of Perpetual Help, your picture reminds us that we are to carry our cross as Jesus did. With courage, he endured injustice, abandonment and betrayal, pain and suffering, even a criminal's death. All: Mary, we turn to you as our model in suffering and courage. You shared in your Son's suffering and death. Now you share in his Resurrection. We, too, share in the cross of Christ, and someday, like you, we will share fully in his Resurrection. Help us be patient in our suffering, and to trust in the loving care of our Father in heaven. May those suffering sickness in mind or body experience your Son's healing power. Help us follow his example, and throughhim, with him, and in him, commend ourselves to the care of our heavenly Father.